I have a funny story to announce. My husband loves condiments. LOVES. I’m not being judge-y, as I love condiments too. But when I go to a lot of trouble to make a spice rub and honey glaze, I’m just a wee bit offended when my sweet husband goes to get barbecue sauce from the fridge, to use as a dip. He realized the error of his ways, and didn’t end up using it. But on Thursday, I was trying to figure out what to make for dinner and gave him 3 chicken options. He opted for this Crispy BBQ Chicken Fingers recipe and confessed to me later that it was partially because it involved barbecue sauce. ;);) I cannot fault him for that! They were certainly tasty. 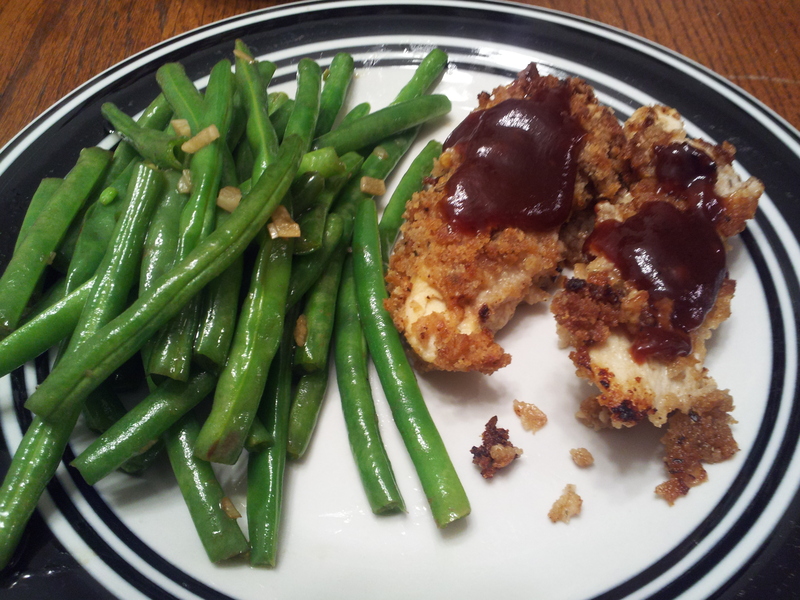 I also paired them with stir-fried green beans, which was loosely based off of a Weight Watchers recipe (1 serving = 1 point). I will include my version of the recipe below (I didn’t have some of the ingredients WW listed, so I improvised, but am pretty sure that using their recipe would change the flavour). You can click the link above to see the original recipe. Also, I’m pretty excited that I used that recipe, since it called for 1/2cu of any type of broth, and I happened to have EXACTLY half a cup left over from another recent recipe. Shazam. 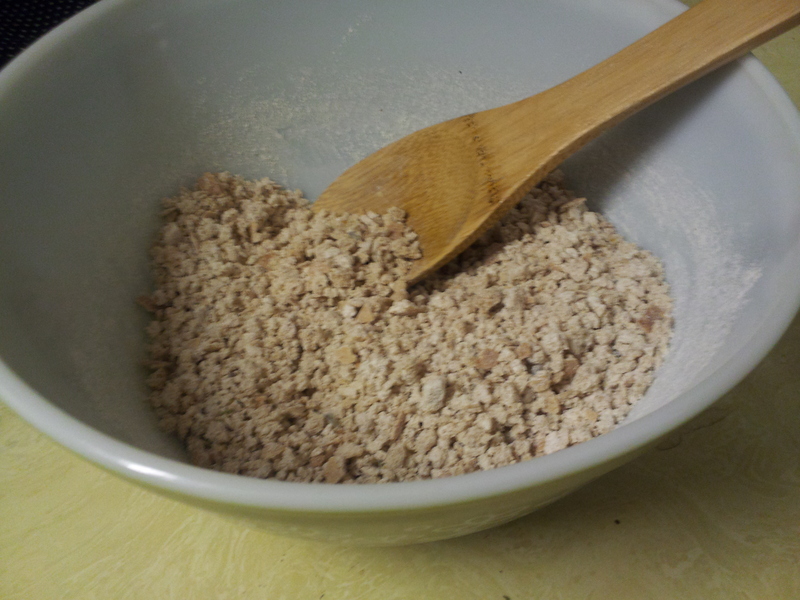 -Combine panko, barbecue seasoning, garlic powder, salt, and flour into a large bowl (now the reason I actually took the bread crumb picture below is because that BBQ seasoning is legit – the mixture seriously smelled like barbecue sauce! I was really excited, haha). Coat chicken pieces in the panko mix, then lay on a wire rack sitting on a baking sheet (again, I don’t have a wire rack, so I just used a baking dish). Spray each piece with cooking spray or olive oil (this helps make them crispy, which is something I learned a few recipes back). -Bake for 10-12mins, flip, coat with cooking spray, and then bake for 10-15 more minutes. -When finished, brush with barbecue sauce. I officially LOVE making my own bread crumbs. It is seriously amazing. My version is loosely based off of the one I linked to…I use whatever extra bread I have laying around, shake in some herbes de province, pulse a few times in the food processor, then bake for a few minutes on 300 (shaking/tossing a couple of times). Perfection. -In a small bowl, combine broth, soy sauce, and sugar, then set aside. -Coat a large wok (or skillet, but c’mon, let’s get real and use a WOK!) with olive oil, and heat over medium. -Add sesame oil, salt, and garlic, stirring to combine. Heat about 1min. 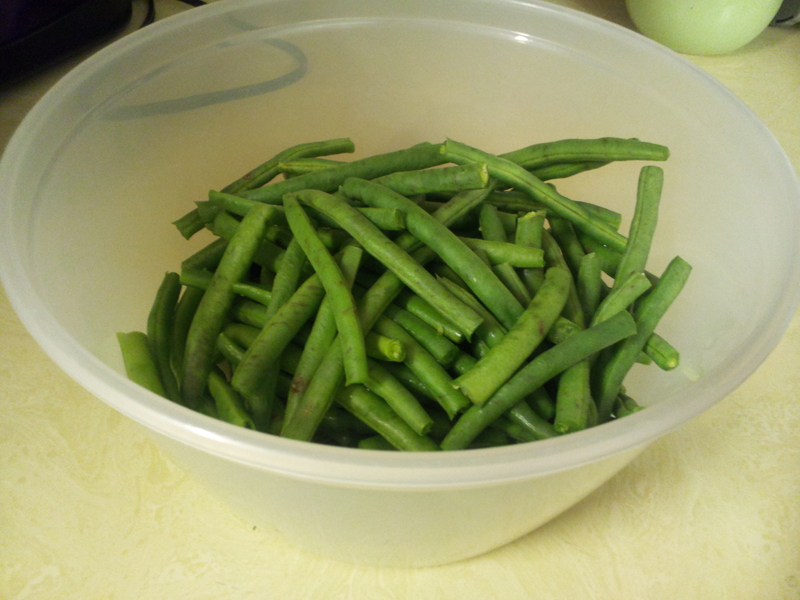 -Add green beans and stir fry for about 5mins, or until crisp-tender. -Add broth mixture and toss to coat. Heat through, about a minute or so, and then serve immediately. -I had about 2 servings, so it was about 2 points. But still wonderful and healthy!